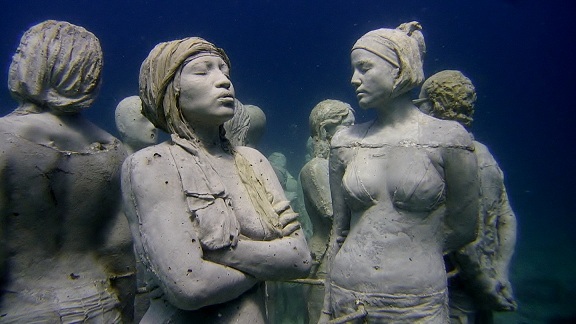 Cancun underwater museum is a wonder in itself which attracts 87,000 of tourists every year. It has become a landmark and a must-see museum in Cancun. In an effort to make the underwater museum even more attractive and to draw visitors who cannot dive, a visitor center has been added. The visitor center showcases the replicas of the underwater museum’s most popular sculptures. The underwater museum started in 2009, is one of its kind in the world. Divers and snorkelers can see the underwater world of 500 statues. Recently 11 new sculptures were added by the artist Jason deCaires Taylor. The museum is also called the “Silent Evolution” gallery. The museum is actually an effort to conserve the natural coral reefs as the statues act as abode for the aquatic wildlife. The results are visible as many statues are barely visible. The new artworks are made of revolutionary form of stainless steel framework and rely on live planted corals to form the narrative and structure of the works. This museum has enhanced the Cancun real estate’s standing in the art and culture world. Cancun which has for long been associated with beaches and spring-breakers is now increasingly becoming a hub of art and culture ( check Beaches, Yoga, Art, Food, Polo – Cancun’s Got It All).